As 22-year-old Aisha Uddin recites Surah Al-Fatiha - the first chapter of the Koran - at home with close friend Sameeah Karim, she may stumble over one word but otherwise the text is perfectly recounted. But unlike Sameeah, 35, who has Pakistani heritage and grew up reading the holy book, Aisha is newer to it: she used to be called Laura and only converted to Islam two years ago. She is pale and has bright blue eyes; originally from Birmingham, until recently she dressed like many other young white British women. "Before it was the jeans, the hoodies, loads of make-up," she says. Now Aisha wears a long black jilbab (a long flowing over-garment) and a cream-coloured hijab (headscarf). "For me now, obviously it's a dramatic change, but it's a change I'm happy I've made, because now I don't have to prove myself to anybody out there." Aisha took an interest in religion at school - and started quietly visiting her local mosque to find out more. "Islam caught my eye and I wanted to look further into it - the people, the culture - and I carried on studying it and studying it, even after school. Living in Birmingham, I was surrounded by the religion." She says she spent years finding out more about Islam before fully committing to the religion, changing her appearance and starting to pray five times a day. "Life's changed dramatically, I was a rebel before, I was always getting into trouble at home, going out and staying out - not trying hard enough at school. "Then when I became Muslim, I sort of calmed down. I wanted to stay at home studying on the internet or reading books. And I'm more happy than I was - I'm proud of who I am, I've got a certain identity." Aisha is one of a growing number of white converts according to a new study by Swansea University for the charity Faith Matters. 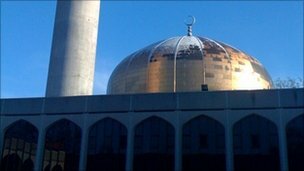 Using a number of sources, including a survey of more than 250 British mosques, census data from 2001 and conversion figures in Europe, the researchers estimate that there could be as many as 100,000 converts - of all ethnic backgrounds - in the UK. This represents an increase on an estimated 60,000 converts in 2001. For an insight into the experiences of Muslim converts, the researchers spoke to 120 - mainly young, white women. Many converts - like Aisha - reported experiencing hostility from their families. She says her parents thought her conversion represented a rejection of her upbringing. "My family they weren't too happy about it, [saying] why change your identity? Why cover your hair? Why dress the way you dress?" says Aisha. "Being in a society where there's so much bad press around... but if you actually get to know these people, they're the friendliest people ever. I'm proud to be Muslim, I don't care what my family say." Aisha does have a wider support network now. She has recently had a traditional Asian wedding to a British Bangladeshi man and lives with her in-laws. She also has a lot of friends, also converts, who she met at new Muslim groups. Aisha pores over pictures of all the women lined up in their different coloured headscarves at her wedding. "That's Lailah, that's Hanan, that's Mary… Sameeah's the only Asian one," she laughs. At Regent's Park Mosque in central London there are many white faces among the crowd for Friday prayers. Conversions happen here every week - largely on a Saturday, and they are mostly women. Tony Blair's sister-in-law, Lauren Booth, is a recent convert and prays there. One London imam, Ajmal Masroor, says the findings of the study come as little surprise to him. He says in his experience around three-quarters of converts are women. "Many people are looking for a spiritual and fulfilling lifestyle rather than the hedonistic, materially-driven one that we have around us," says Imam Masroor. "They find an answer in Islam. Women are hard-wired to reflect and think and take things more seriously, even from a young age. "This has been going on for the last 20 years and more so since 9/11. People are curious, so they go to the book rather than the distorted media headlines. "They learn that Islam is fulfilling as a personal journey as well as a collective conscience." Sarah Joseph sits in her office studying the latest edition of Emel, the Muslim lifestyle magazine she edits. She converted to Islam as a teenager and has adopted the headscarf, saying she was looking for something with more meaning. "I'd grown up in a model agency and I'd been surrounded my whole life by external beauty, and the hijab was, and very much is, about the search for inner beauty," she says. Despite the difficulties, Sarah says British converts have a vital role to play in explaining two sides - Britain's Muslim and non-Muslim communities - to each other. "[Converts have] authentically belonged to two traditions and should act as a conduit to show each side that we share far more than we differ."